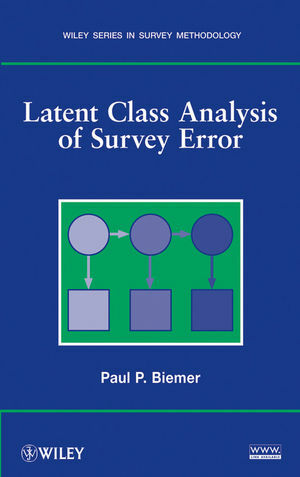 Combining theoretical, methodological, and practical aspects, Latent Class Analysis of Survey Error successfully guides readers through the accurate interpretation of survey results for quality evaluation and improvement. This book is a comprehensive resource on the key statistical tools and techniques employed during the modeling and estimation of classification errors, featuring a special focus on both latent class analysis (LCA) techniques and models for categorical data from complex sample surveys. Throughout the book, more than 100 real-world examples describe the presented methods in detail, and readers are guided through the use of lEM software to replicate the presented analyses. Appendices supply a primer on categorical data analysis, and a related Web site houses the lEM software. Extensively class-tested to ensure an accessible presentation, Latent Class Analysis of Survey Error is an excellent book for courses on measurement error and survey methodology at the graduate level. The book also serves as a valuable reference for researchers and practitioners working in business, government, and the social sciences who develop, implement, or evaluate surveys. Paul P. Biemer, PhD, is Distinguished Fellow in Statistics at RTI International and Associate Director for Survey Research and Development at the Odum Institute for Research in Social Science at the University of North Carolina at Chapel Hill. An expert in the field of survey measurement error, Dr. Biemer has published extensively in his areas of research interest, which include survey design and analysis; general survey methodology; and nonsampling error modeling and evaluation. He is a coauthor of Introduction to Survey Quality and a coeditor of Telephone Survey Methodology, Survey Measurement and Process Quality, and Measurement Errors in Surveys, all published by Wiley. 1.1.1 An Overview of Surveys. 1.1.2 Survey Quality and Accuracy and Total Survey Error. 1.2 Evaluating the Mean-Squared Error. 1.2.1 Purposes of MSE Evaluation. 1.2.2 Effects of Nonsampling Errors on Analysis. 1.2.3 Survey Error Evaluation Methods. 2. A General Model for Measurement Error. 2.1.1 A Simple Model of the Response Process. 2.1.3 Effects of Response Variance on Statistical Inference. 2.2 Variance Estimation in the Presence of Measurement Error. 2.2.2 Special Case: Two Measurements. 2.2.3 Extension to Polytomous Response Variables. 2.3.1 Designs for Parallel Measurements. 2.3.3 Example: Reliability of Marijuana Use Questions. 2.3.4 Designs Based on a Subsample. 2.4 Reliability of Multiitem Scales. 2.5 True Values, Bias, and Validity. 2.5.1 A True Value Model. 2.5.3 Example: Poor- or Failing-Grade Data. 3. Response Probability Models for Two Measurements. 3.1.2 Implications for Survey Quality Investigations. 3.2 Estimating π, θ, and φ. 3.2.1 Maximum-Likelihood Estimates of π, θ, and φ. 3.2.2 The EM Algorithm for Two Measurements. 3.3 Hui–Walter Model for Two Dichotomous Measurements. 3.3.2 Example: Labor Force Misclassifi cations. 3.3.3 Example: Mode of Data Collection Bias. 3.4 Further Aspects of the Hui–Walter Model. 3.4.2 Example: Misclassifi cation with Three Categories. 3.4.3 Sensitivity of the Hui–Walter Method to Violations in the Underlying Assumptions. 3.4.4 Hui–Walter Estimates of Reliability. 3.5 Three or More Polytomous Measurements. 4. Latent Class Models for Evaluating Classifi cation Errors. 4.1 The Standard Latent Class Model. 4.1.2 An Example from Typology Analysis. 4.1.3 Latent Class Analysis Software. 4.2 Latent Class Modeling Basics. 4.2.2 Probability Model Parameterization of the Standard LC Model. 4.2.3 Estimation of the LC Model Parameters. 4.2.5 Example: Computing Probabilities Using Loglinear Parameters. 4.2.6 Modifi ed Path Model Parameterization. 4.2.8 Example: Computing Probabilities Using Modified Path Model Parameters. 4.3.1 Example: Loglinear Parameterization of the Hui–Walter Model. 4.3.2 Example: Analysis of Past-Year Marijuana Use with Grouping Variables. 4.4 Model Estimation and Evaluation. 4.4.1 EM Algorithm for the LL Parameterization. 4.4.6 Example: Continuation of Marijuana Use Analysis. 5. Further Aspects of Latent Class Modeling. 5.1.3 Checking Identifi ability with Expeculation. 5.2.4 A Strategy for Modeling Local Dependence. 5.2.5 Example: Locally Dependent Measures of Sexual Assault. 5.3 Modeling Complex Survey Data. 5.3.1 Objectives of Survey Weighting. 5.3.2 LCA with Complex Survey Data. 5.3.3 Including Design Variables in the Fitted Model. 5.3.4 Weighted and Rescaled Frequencies. 5.3.6 Treating the Average Cell Weight as an Offset Parameter. 5.3.8 Illustration of Weighted and Unweighted Analyses. 6. Latent Class Models for Special Applications. 6.1 Models for Ordinal Data. 6.2 A Latent Class Model for Reliability. 6.2.2 Comparison of Error Model and Agreement Model Concepts of Reliability. 6.2.3 Reliability of Self-Reports of Race. 6.3.1 Latent Class Capture–Recapture Models. 6.3.4 Example: Evaluating the Census Undercount. 6.3.5 Example: Classifi cation Error in a PES. 7. Latent Class Models for Panel Data. 7.1 Markov Latent Class Models. 7.1.2 Example: Application of the MM Model to Labor Force Data. 7.1.3 Markov Latent Class Models. 7.1.4 Example: Application of the MLC Model to Labor Force Data. 7.1.5 The EM Algorithm for MLC Models. 7.1.6 MLC Model with Grouping Variables. 7.1.7 Example: CPS Labor Force Status Classification Error. 7.1.8 Example: Underreporting in Consumer Expenditure Survey. 7.2 Some Nonstandard Markov Models. 7.2.2 Latent Class Mover–Stayer Model. 7.2.4 Example: CEIS Analysis with Four Timepoints. 7.2.5 MLC Model with Time-Varying Grouping Variables. 7.2.6 Example: Assessment of Subject Interests. 7.2.7 Multiple Indicators at One or More Waves. 7.3 Further Aspects of Markov Latent Class Analysis. 7.3.1 Estimation Issues with MLCA. 7.3.2 Methods for Panel Nonresponse. 7.3.3 Example: Assessment of Subject Interests with Nonresponse. 8. Survey Error Evaluation: Past, Present, and Future. 8.1 History of Survey Error Evaluation Methodology. 8.1.1 The US Census Bureau Model for Survey Error. 8.1.2 From Bross’ Model to the Standard LC and MLC Models. 8.1.3 Loglinear Models with Latent Variables. 8.2 Current State of the Art. 8.2.1 Criticisms of LCA for Survey Error Evaluation. 8.2.2 General Strategy for Applying LC and MLC Models. 8.3 Some Ideas for Future Directions. Appendix A. Two-Stage Sampling Formulas. Appendix B. Loglinear Modeling Essentials. B.1 Loglinear versus ANOVA Models: Similarities and Differences. B.2 Modeling Cell and Other Conditional Probabilities. B.3 Generalization to Three Variables. B.4 Estimation of Loglinear and Logit Models.